No matter what your sewage requirements, BioMAX has Western Australia’s widest range of robust wastewater recycling systems to cater for up to 13,300 personnel per day. BioMAX systems range from the Model C10 that caters for a small gatehouse through to models larger than C500K which can provide wastewater treatment and recycling solutions for large communities. You can feel confident you can install a BioMAX system anywhere with ease. There are numerous reasons to choose a BioMAX system over other more traditional wastewater disposal methods. The recycled water that is produced is clear and odourless, enabling it to be used on landscaped areas to significantly reduce future water bills. Unlike septic tanks and associated below ground soakage systems, the BioMAX is not subject to the constraints of gravity in the reuse of the treated water. This allows the water to be directed to different locations. The BioMAX also eliminates the health problems associated with winter flooding of septic tanks. Over 3,500 BioMAX systems have been installed Australia wide. Our clients list is extensive and includes major mining companies, oil companies and government authorities. We believe there is only one way to build wastewater recycling systems that handle a potentially harmful product like sewage and that is with proven technology. We use only the highest quality components and the latest advancements in technology. BioMAX sources the best components from all over the world. We use irrigation dripper lines produced in Israel, our Busch aerators are imported from Germany and our discharge pumps are from Denmark. Each of these countries is a world leader in the fabrication of these components. thicker 50mPA concrete for strength and corrosion resistance. We believe in letting the biological process and gravity do most of the work. The adequately sized discharge pump and air blowers are the only moving parts within the BioMAX system. Our uniquely designed airlift system efficiently takes care of the rest. By using only one pump (similar systems on the market use two), the potential for pump failure and the need to carry critical spare parts is reduced. BioMAX will consult with you to ascertain your needs in order to design, build and install according to your specific requirements. The quality of water converted by our commercial recycled water systems continues to improve as we further develop the technology. The BioMAX systems are designed to conform with the most stringent standards in Australia (Health Department of Western Australia), as set down in the Specification for Aerobic Treatment Units (ATUs). Faecal coliform organisms: < 10 per 100 mL. The data below outlines the results from water quality testing conducted on the 5th August, 2010. It shows a dramatic improvement on previous results. The desirability of nutrient removal in a wastewater treatment system will vary depending on the characteristics of the receiving environment. In most applications the residual nutrient content in the effluent from a BioMAX system will “feed” the flora in the irrigation disposal field or be “taken up” in the soil, substituting the application of chemical fertilizers to the garden. Total Nitrogen (TN): Almost complete nitrification takes place within the system. TN reduction achieved varies between 80% and 100%. With TN loads of 50 mg/L, discharge levels could be between 0 – 10 mg/L. Total Phosphorus (TP): Without Alum Dosing, experience has shown that the effluent phosphorus levels are typically about 75% of the influent indicating that some phosphorus is being bound up in the biomass in the anaerobic and aerobic chambers. Consequently if the influent concentration is 6 mg/L, then the effluent would have 4.5 mg/L of phosphorus. With Alum Dosing, complete phosphorus removal is then achieved. The effluent from a BioMAX system is approved for dripper irrigation. 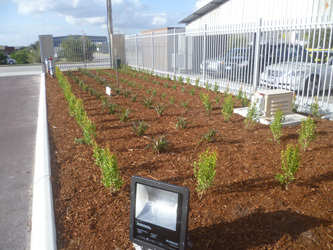 To suit areas where direct public access could lead to vandalism of the equipment or in areas subject to winter frost or in sub-alpine conditions the company has developed a range of dripper emitter irrigation systems. Sub-strata dripper systems (under a layer of mulch) are suitable for gardens or landscaped areas. The size of the disposal field will vary depending on soil type and size of the system. 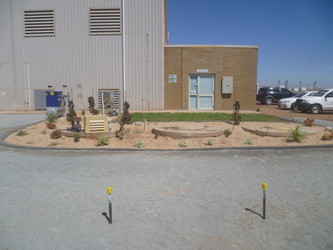 The BioMAX treated wastewater exceeds the standards required by the Health Department of Western Australia (the most stringent standards in Australia), however all aerobic treatment systems must, by legislation, be monitored periodically. The BioMAX team of trained technicians ensure all systems are finely tuned to perform to the highest possible standard. A written report keeps our clients in touch with the performance of their system. Copies are sent to local government and the Health Department. A copy is also kept on our files giving us an ongoing record of every system’s performance. The following process description and schematic flow diagram will assist in the understanding of the treatment processes used for the BioMAX Wastewater Treatment Plant. Raw wastewater is initially received into the anaerobic chamber. Approximately 30 50% of the suspended solids settle out in this chamber where they undergo anaerobic digestion. The anaerobic digestion process is carried out by microorganisms which have the ability to feed, grow and multiply in the absence of free oxygen. In addition, settled sludge and skimmed material returned from the clarification chamber are further digested in this chamber. The plant is sized to enable these microorganisms to maintain a sufficient population naturally without the need for the addition of proprietary biological products. The partially treated wastewater, still containing the colloidal and dissolved solids which represent approximately 65% of the pollution loading, flows from the anaerobic chamber to the aerobic chamber. Air is introduced to the liquid in this chamber by means of an aerator and diffusers, maintaining aerobic (free dissolved oxygen) conditions. The oxygen enriched effluent flows about packs of submerged media having a large surface area on which bacteria and other microorganisms thrive, forming a biological film. These microorganisms have a different growth process to those in the anaerobic chamber in that they utilise the dissolved oxygen in the effluent, while consuming the dissolved and colloidal organic matter as food to create new cell growth and stable oxidised products. The air pattern causes the liquid in the chamber to pass through the media in a discreet flow pattern and to have intimate contact with the microorganisms. The process differs from ordinary suspended growth systems in that it is more stable and also allows the growth of sub-surface anaerobic microorganisms beneath the surface film of aerobic microorganisms. This allows anaerobic bacterial action to check the media growth, thereby reducing the biological sludge accumulation. Nevertheless, as the thickening of material on the media occurs, some sloughing off will take place. The multiple compartment design of the aerobic chamber ensures that no short-circuiting can occur, preventing the possibility of partially treated wastewater passing to the clarification chamber. The diffused aeration system allows the air to be introduced below the media packs. settleable (colloidal) solids into carbon dioxide and a biological floc, which, under quiescent conditions, will settle. Following aeration, effluent flows into a circular hopper bottomed clarification chamber, where the biological floc (or sludge) settles under quiescent conditions. Settled sludge from the bottom of the chamber and floating material are returned to the anaerobic chamber. From the clarification chamber, the effluent is drawn off below surface level and flows through the chlorinator to the disinfection chamber. This continuous return of sludge to the anaerobic chamber ensures continuous fluid movement in the plant even with zero inflow and keeps the system “live” during periods of extended vacancy. The discharge from the clarification chamber passes through an automatic gravity chlorinator. The chlorinator is calibrated for above normal water usage. Chlorine stocks are provided to cover maximum usage with built in safety factors to cover all foreseeable circumstances between the service periods. The disinfection chamber is designed to provide a minimum of 30 minutes contact time between the effluent and chlorine to ensure achievement of bacterial die-off. After disinfection, the treated effluent enters the pump-out chamber. The discharge pump is automatically controlled by a level switch to operate and shut down as the level of the effluent rises and falls. The BioMAX has two mechanical components; an air blower and a discharge pump. An alarm is provided to warn of failure of these units. The plant has an in-built emergency storage of approximately two days to ensure that any problem can be rectified before overflow occurs.